I have a ton of apple recipes that I want to make this fall. So many that I don’t think I’m going to get them all made before it officially becomes winter. Which leaves me with two choices. 1. Continue blogging apple recipes right on through winter. Or 2. Save them for next year. While I am somewhat concerned that I may overwhelm you with apple recipes, I figure that’s better than saving them for next year only to find that I have a ton of other apple recipes I saved throughout the year. The recipe for apple pie cupcakes immediately stood out to me. I love apple pie. For the longest time, it was the only type of pie I’d even eat! But I do enjoy portion control which is why I love when you can take a larger recipe and scale it down into a smaller one, like a cupcake. However, this are SO GOOD that I can’t guarantee that you’re only going to eat one of them. But hey, at least I warned you first! 1. Line a cupcake pan with paper liners. Preheat the oven to 350. 2. In a medium bowl, combine the flour, cinnamon, baking soda, baking powder and salt together. 3. In the bowl of your stand mixer, beat the eggs and sugar together until pale. Add the buttermilk, vegetable oil and vanilla to the mixer until combined. Slowly add the flour mixture into the stand mixer until no lumps remain. The batter is runny. 4. Fill each paper line 2/3 of the way full with the batter. Bake for 15-18 minutes or until a toothpick inserted in the center comes out clean. Remove from the oven and let cool to room temperature. 5. While the cupcakes are cooling, combine the apples, butter, brown sugar and cinnamon together in a small saucepan over medium heat. Stir occasionally and cook for 5-6 minutes, or until the apples are tender. 6. In a small bowl, whisk together the water and cornstarch. Pour over the apple mixture and stir to combine. Remove apples from heat and set aside. 7. When cupcakes have cooled, use a paring knife to cut an inverted cone shape out of the center of each cupcake. 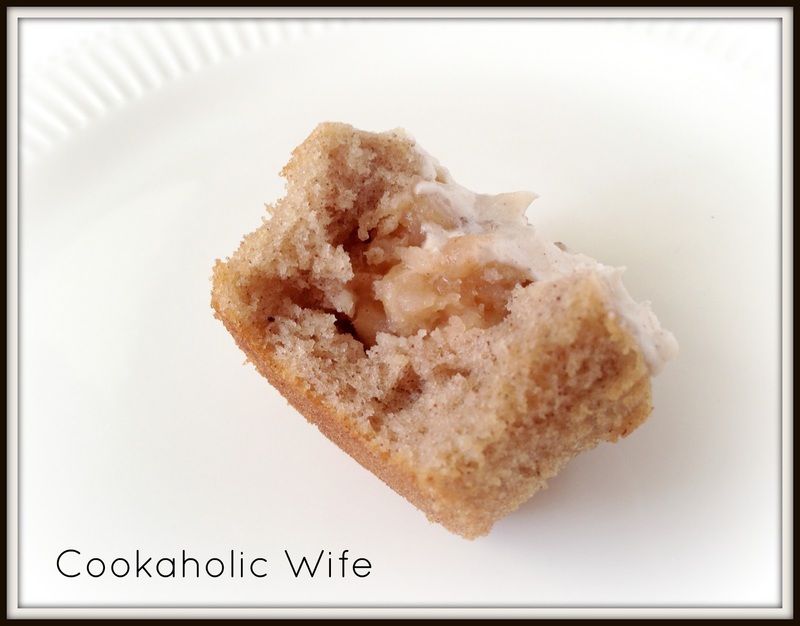 Fill the cupcake with a spoonful of the apple mixture. 1. Combine the butter, powdered sugar, honey and cinnamon together in the bowl of your stand mixer. Beat on medium speed until smooth, adding the milk by the tablespoon if needed. 2. Transfer frosting to a piping bag fitted with a large decorative tip. Pipe icing onto cupcakes. I hope you have a sweet tooth. 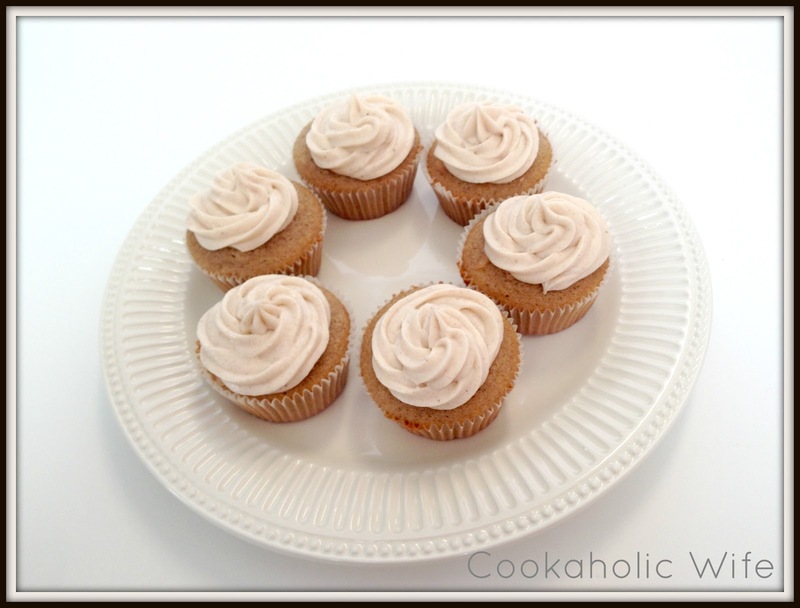 These cupcakes taste just like an apple pie but with an extra dose of sweetness from the frosting. I already cut back the sugar in the original cupcake recipe, so if you aren’t a big sweets person, I’d go with a less sugar-heavy frosting.